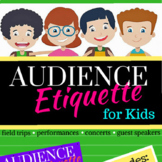 Audience Etiquette Skit -- UPDATED! 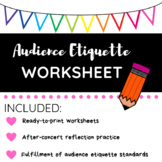 Teach audience etiquette using this fun foldable! This foldable covers no talking, no cell phones, no candy wrappers, arriving early, and removing crying children. 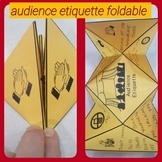 Students can then tape the foldable in their theater interactive notebooks and can reference it before class performances. 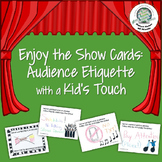 Outstanding tool for teaching audience manners to students K-12. Even good for adults! A fun way of looking at an important topic! 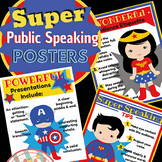 Ten (10) PowerPoint slides that will lead the class in a discussion about how speakers and their audience should conduct themselves in a public speaking situation. This is part of a semester long course called Communication Application. 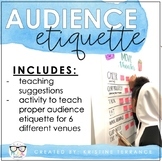 After teaching students the basics of audience etiquette. Tableau is a simple way to introduce students to performing on stage as it only requires posing. This project combines both topics into one assessment. 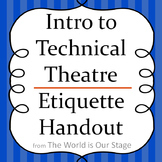 This quiz accompanies a project in which students teach one rule of audience etiquette with a tableau. See my other products for this project. This fill-in-the-blank notes activity corresponds with the PowerPoint Presentation that covers the "Ten Commandments" of Audience Etiquette in a fun, simple way. These ten commandments are essential for any Drama class, and there is also a Quiz covering the ten commandments available in my store. This quiz corresponds with the PowerPoint Presentation that covers the "Ten Commandments" of Audience Etiquette in a fun, simple way. These ten commandments are essential for any Drama class, and there is also a fill-in-the-blank notes activity covering the ten commandments available in my store. 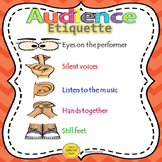 A list of guidelines for student behavior when watching a performance. 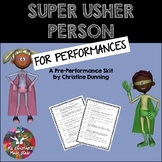 This is targeted toward field trips to plays, concerts or dance recitals, but can also be used for classroom performances. 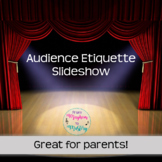 This is a Powerpoint presentation and a "fun way" to introduce the ten commandments and rules of audience etiquette for a drama class. 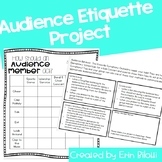 This is a full week lessons on Audience Etiquette with project and quiz included. This lesson can be shortened or extended to fit your needs. Enjoy! 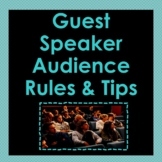 This product includes 8 slides covering various tips for audience behavior during a guest speaker. The presentation is editable, so you can add your own rules, requirements, and tips.